Little Angels strongly believes in assisting those with psychiatric disabilities for both civilians and veterans. While this is a disability that is often overlooked, it is a condition which can be even more detrimental than some challenges which are strictly physical. Recently, the public has received education regarding psychiatric service dogs with respect for our soldiers who are returning from war with PTSD. The trainers and volunteers of Little Angels work diligently to place dogs with our soldiers, as well as civilians who suffer from similar forms of PTSD, and other psychiatric conditions such as severe anxiety and depressive disorders. Medical Alert: Just as a dog can be trained to alert to seizures and other medical conditions, a dog can also be trained to sense the changes in a person’s body when they are beginning to have a panic attack, flash back, anxiety attack, or other psychiatric conditions. The dog is able to paw at the leg of their disabled recipient and interrupt what would otherwise be a debilitating and destructive behavior for the individual. This helps the handler to refocus on their dog and work through the problem. Deep Pressure Therapy: Just as medical wraps are used to alleviate anxiety in persons with psychiatric conditions, dogs can be trained to put the pressure of their body weight on their handler’s lap and abdomen to physically, and then mentally, relieve anxiety and induce a sense of calm. Non-Protective Boundary Control: When the individual suffers from anxiety due to the close proximity of others, or due to the claustrophobia in a crowded room, the dog can be trained to stand in between their handler and others to gain more personal space. The dog is not being protective, but is simply following a simple cue from their handler to move their body into the space surrounding their handler, in a down-stay position. Corners: A frequent problem for those suffering from PTSD is to negotiate corners without the fear of what is waiting on the other side. Our dogs can be trained to go around corners in front of their handler and the alert their handler if there is someone waiting on the other side. Over time this form of therapy can assist the disabled recipient when becoming more comfortable with going into public. Signal Alert: There are many situations when a recipient will need to excuse themselves from a classroom or meeting due to person psychiatric concerns. With a discrete signal to the dog, the handler can command his dog to paw at the leg, making it look like the dog is seeking attention. The handler is then able to comfortably leave the situation wit the excuse that his dog needs to relieve itself. Companionship: It goes without saying that any service dog’s greatest assistance is the emotional support they can offer their handler. Most disabilities present trials that can be relieved on a mental level simply by the dog’s presence. A well behaved dog can help to lower blood pressure and give a sense of ease to anyone who is near. We do not create unnecessary tasks for dogs to complete simply because we are looking for a way for dogs to “assist with a specific disability”. Public Access Laws state that a dog cannot be granted public access simply for emotional support, and that the dog must be trained in specific tasks to assist their disabled partner. Because of this, many are “looking” for tasks to train their dogs. We will not train a dog to pick items up off the floor if you can easily do this, etc. We will not train a dog to protect you – it is not safe. We WILL train a dog to assist you with actual tasks for actual needs. Is a Little Angels Psychiatric Service Dog Right for Me? Have a life-inhibiting psychiatric condition, with documentation from your doctor supporting your diagnosis. Have strong communication skills and the ability to be consistent with a dog regarding training exercises. Have a love for dogs. Have patience to work through problems (Even a trained dog is still a dog). Have finances to provide your dog with veterinary care and maintenance for the next 10-12 years. Be willing to travel to San Diego, California or Bartlett, New Hampshire for Handler Training, preferably with a friend or family member for support. Handler Training is where the disabled party learns how to work with the dog as a team. This generally takes 14 days, with training every day. This is when the dog learns to respond to the commands of the handler, and when the handler learns how to reinforce the training that the dog has already received. We cover practical, day-to-day life experiences so you will feel confident taking the dog into your care. We work in real-life situations such as outings to shopping malls, restaurants, and parks so you will feel comfortable taking the dog with you into the public setting. After the completion of Handler Training, we work together on a series of field tests, which are administered by the trainer. After graduation, you and your dog will be certified as a working team. A certification card will be provided to the handler, as well as a service vest and identification tag for your dog, which labels him or her as a service animal. We have a lifetime commitment to each recipient and each dog that we place. Once you and your dog have graduated we maintain contact to insure that your dog’s training and assistance remains in tact, that the dog remains healthy and happy, and that the dog is improving your quality of life. Submit a personal referral and medical documentation: If your initial applications looks like a good fit we will request these documents from you. If accepted, we will contact you to schedule a phone consultation: The consultation is an average of 60 minutes during which we discuss realistic expectations of how a service dog can assist you, and to make sure you are a good fit for one of our dogs. The agreement: If we believe one of our service dogs can assist you we will write our a customized agreement and ask you to review your final decision with friends and family. Return your agreement with your $500.00 minimum deposit, to be added to our waiting list: The deposit is your sign to us that you are committed to the program. Once this is received we begin fundraising for the costs associated with your dog. Fundraising: Organizations nationwide spend an average of $50,000 on each assistance dog trained. 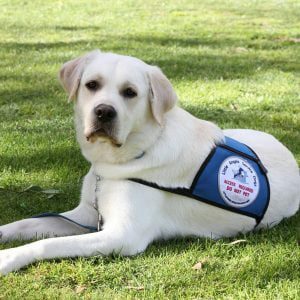 The average service dog graduates with over 600 hours of training, and with that expense also comes veterinary care, boarding, grooming and training supplies. Because of the commitment of all our wonderful volunteers, Little Angels spends $38,000 per dog. This is an expense covered through fundraising. We ask our recipients to be responsible for the first 1/4 of the ex pense, which is $9,500. This is usually covered through fundraising, and we are happy to help guide you through that process. Dog Selection and Specialized Training: Once the funds are met, regardless of how the funds were raised, we move you to the second part of our waiting list where you are a priority for dog placement. This is when we choose a dog from our training program that has the natural propensities to assist in the ways needed for your disability, and we continue any additional specialized training needed specifically for your needs. Handler Training: During handler training we work with you, one-on-one and show you how to reinforce the training your dog has already had. Once you and your dog graduate our program we stay in daily contact for the first month, followed by monthly, and bi-yearly consultations for reports on your dog’s ability to continuously provide assistance to you and your child. Handler Training takes place in San Diego, California or Bartlett, New Hampshire. The Anxiety Research Center and Curtis Hsia, Ph.D.
Dr. Hsia specializes in treating anxiety through cognitive behavioral therapy, and is an advocate in therapy through the use of Service Dogs through Little Angels. Dr. Hsia is available for consultations by phone for those who reside outside of California.